It’s almost Christmas and we’re still HO HO HO-ing at my house! Sooo... if you are one of those last minute decorators like me this year, I have a super-easy and inexpensive project for you…my DIY Dollar Tree snow village! It only takes a little bit of time and very little $$$ for this one! I think the snowy church is my favorite! Now just create a village scene and add faux snow and some little trees if you wish. And…taaa daaa!…here it is! I only spent $4.00 since I already had everything but the little houses. Could it be any easier or less expensive? I love the old-fashioned touch it’s adding to my Christmas décor! And…shopping alert!…while you are in Dollar Tree, be sure to check out these pretty mercury glass votive holders! I love the way they sparkle! Here's another idea for transforming inexpensive Christmas decor...my DOLLAR STORE NATIVITY MAKE-OVER. I love the difference a little white paint can make! You have to see the before to believe it! And just in case you need a few more ideas for last minute Christmas decorations, here are my vintage paper Christmas trees…so easy and fun to make that the kiddos could help you! 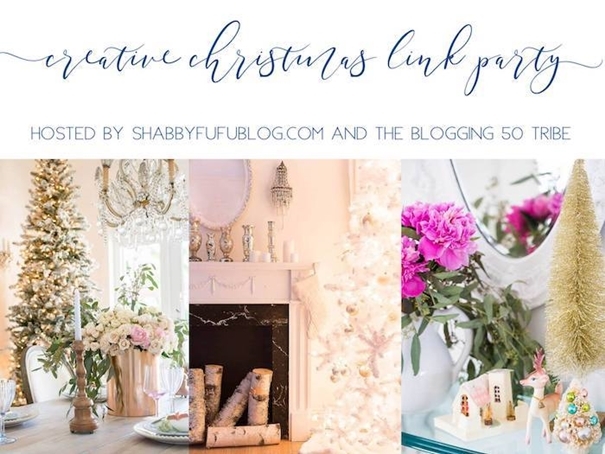 And still a favorite of mine…here’s another last minute way to add some Christmas to your home…my shabby Christmas centerpiece! All you need is scrapbooking paper, bamboo skewers and some greenery from your yard! And speaking of snow…Baby Kitty is still thinking about the big snow (well, big for us here in the South) that we had last year and is crossing his toes that we will get at least one good snow this winter! How about you? Such a great idea - looks like an expensive collection! Your DIY ideas are always so fantastic and this white village is amazing. You should have your own show on HGTV. So simple and so easy to do but with a big impact. Debbie, you totally amaze me. I adore your village. Gorgeous. Love the painted villages. I never thought about painting them. They look great! Have a Merry Christmas! Love the painted villages! This would also be a great finish for figurines found at a second hand shop to give them a fresh look. ♥♥♥ it, sparkly and white, could not be better oh and it is inexpensive and doable too!! Love love your frosty snow village - such a nice holiday vignette! Pinning for next year. I love your idea of transforming those little houses into a snow village,really wonderful. Cute little snow village! I'm too busy enjoying the sun and sand to do any other Christmas decor! This is an unusual year for me but I'm loving it! The transformation is awesome! Never would have thought they looked like the 'before' picture. Merry Christmas! Another winner for easy and inexpensive, but still absolutely beautiful! You are so creative, have great ideas, and give easy to follow instructions. I always enjoy whatever you are doing. Thanks so much for posting about your Christmas village! I have already collected the houses and a few trees, but didn't know quite how to go about making them look like yours. Are you a mind reader?! I just love this...will be visiting the Dollar store...they really are BEAUTIFUL!!! Just darling, Debbie! Thanks for sharing that great tutorial with us! Love this idea! You are full of creativity and so willing to share! Thank you - I'll be on the lookout for some village houses for next year. Your crafty white village is on my list of crafts to do for next year. I will be checking the dollar stores after Christmas sales for a little village that I can paint too. Thank you for sharing this wonderful idea. This is the perfect time of year to get holiday items at rock bottom prices, so I will be on the lookout for some village figures. I'm already on a roll. Last week I got five sets of beautiful shatter proof ornaments for my front porch next Christmas, regularly $16 a set, marked down 90%. Fifty ornaments for $8.00!!!! These are just too cute. thank you. The Dollar Tree village idea sure struck a cord with me. I have some old Christmas village pieces from back twenty years or so and think I will update them with this idea. Thanks for the inspiration. This is still such a great idea. Thank goodness for white spray paint! I am blown away at the difference that snow village looks! I would have never thought to do that! Seriously amazing. Grinned and Pinned! Your village turned out fabulous. White spray paint is amazing stuff! Ooo, I love this! Gonna have to check out Dollar Tree! Love this so much. Love the village and am planning to use for window-scaping but wanted to know what spray paint did you use? Color? TIA ! I used Rust-Oleum American Accents Ultra Cover 2X Flat White Spray Paint and Primer in 1. So glad that you like it!